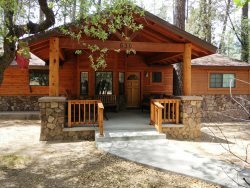 Stag’s Leap Lodge is a beautiful, custom cabin in a tall pines neighborhood just 10 minutes from downtown Prescott. This spacious property is 3200 square feet and has 4 bedrooms and 3 baths. The Master bedroom is complete with a King bed and SAT flat screen TV. With several chests of drawers and a big walk-in closet, you could unpack and stay for weeks. An elegant en suite bath invites relaxation with a garden tub and shower which closes off to make a steam room. Two more bedrooms with Queen beds and SAT/TV’s are also located on the main floor. The 4th Queen bedroom is downstairs with the game room and bar. The game room has a pool table, foosball table and large gaming TV with upgraded sports programing and Xbox (bring your own games.) The large modern kitchen is completely stocked and equipped with stainless steel appliances and dishwasher. All dishes and linens are provided, just bring food and clothes. The dining are opens out onto the upper deck with a patio set, conversation area and propane grill. This deck overlooks a sweet, babbling creek. The living room is warm and inviting with couches to enjoy chilly evenings around the gas fireplace. Stag’s Leap Lodge has Internet, washer/dryer and Central heating and cooling. This property does accept pets but the owner prefers them to be small. This is located in a high end tall pines area with other custom cabins but it is close and convenient to downtown. One of the finest vacation rentals you will find in the Prescott area!